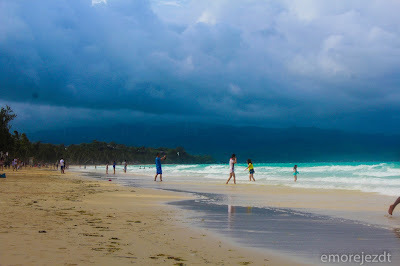 Hello guys, I believe that many of you have been experienced the paradise in Boracay, right? Let me share mine too. For how many years, at last I've experienced Bora since I've given the opportunity to travel with a minimal amount of money to spend. It's just finding cheaper hotels, cheaper flights and cheap foods (hehehe). I was so impressed on what I've seen in Boracay beach. By the time I took my first step on what they call "Creamy Powdery White Sand" I said to my self "At Last, This is it, This is Paradise" (medyo OA but it's true.). Boracay is the most beautiful beaches that I've ever been. It's a great opportunity to travel to other place specially to the liveliest beach in the Philippines. I really love travelling and adventures but in some cases I can't do it because of some financial issues. Same as other reviews and articles the best thing I've like Bora is their creamy white sand. For budget travelers, you don't have to worry about your daily meals because you can find several fast food chains and cheap restaurants in the area. You can also avail promos offered by several travel agencies. I've got a lot of fun and travel experience in this place. I hope you too.